Wild Mustard is a bristly erect annual/biennial plant with wiry branches and a tap root.If left to grow wild it can reach over 1m in size. It starts as a rosette of deeply divided leaves with toothed margins. The leaves are lanceolate to ovate in shape with the lower leaves larger than the tops. The leaves can range in size from 5cm-15cm in size and alternate up the stem. The flowers are terminal, yellow and have 4 petals(as do all brassicas).The flowers are between 0.5 and 1cm in size. The seed pods are short and narrowly conical ranging between 1cm and 3 cm in size and held tightly along the stem. The leaves and seeds and young flowers are all edible. The leaves are great in salads and go really well in stirfrys. The seeds can be eaten raw in salads or dried and ground down to be used as mustard like flavouring. The young flowers are excellent eaten raw on their own or added to a salad. 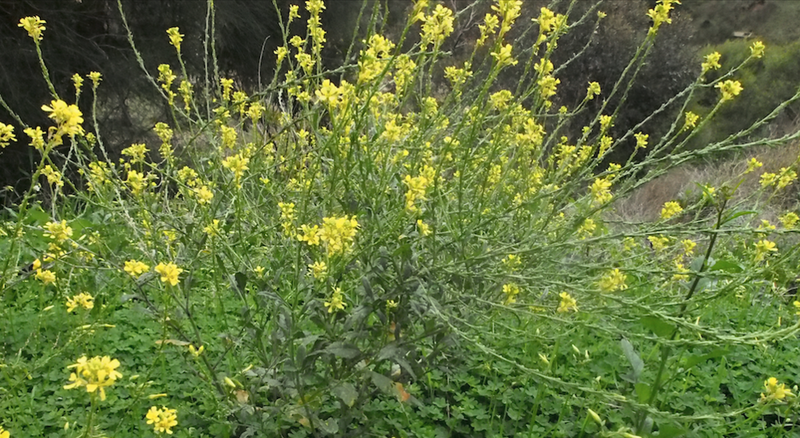 Wild mustard has been used to treat: Chest and lung diseases, coughs, urinary obstruction, throat ulcers. It has also been used as a laxative an antiseptic and expectorant.